We’re live on iPhone and iPod touch! At Playfish, we’re huge fans of iPhone and the iPod touch. We speculated last summer that the iPhone would make an impact on social games. So we’re today very excited to be part of the launch of Facebook Connect for the iPhone and iPod touch and proud to announce our first games, downloadable from iTunes, that let you play with your Facebook friends any time, anywhere. Read the official press release here. Our first title, Who Has The Biggest Brain? – played by over 15 million people so far, is available for download now in the iTunes Store. 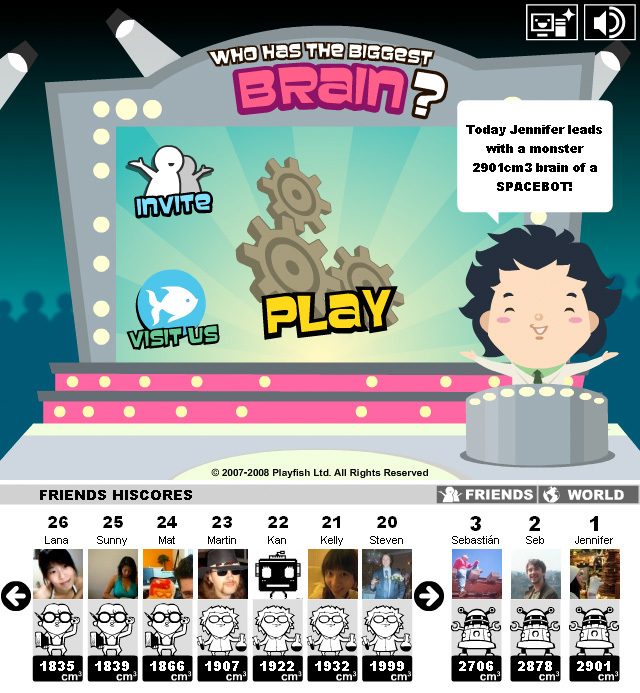 It features the full pro-mode of the game – 12 mini games, a practice mode, a performance calendar, and the ability to connect and compete with your Facebook friends, see their pictures, scores and check their brain profiles. The game is of course fully optimised for the touch screen interface and you can even unlock a mobile exclusive achievement to show off online! Read about the full feature set here. Additionally, Word Challenge and Geo Challenge will be available for download on iTunes by summer. As with Who Has The Biggest Brain? both games take full advantage of the touch screen interface. The games have feature sets similar to the fully unlocked Facebook pro versions you’re familiar with, but add content exclusive to the iPhone and iPod touch. And – most importantly – they let you play with your Facebook friends! We believe Facebook Connect for the iPhone and iPod touch will revolutionise how games are played on mobile. Instead of playing to kill time, you can now play to interact, express, communicate or compete with friends – which are far more interesting emotional drivers to play games. Being a launch partner for Facebook Connect and offering games for the iPhone and iPod touch is an important step in Playfish’s mission to change how the world plays games by creating experiences that are more social and connected. We’re very grateful for Facebook’s support and, as always, look forward to your feedback and ideas! We’ll be releasing a few updates and tweaks over the coming weeks so be sure to let us know if you have ideas of how to make Who Has The Biggest Brain? on the iPhone and iPod Touch even better. Some screenshots are below. To try it out yourself, download the game now from the iTunes Store! And be sure to let us know what you think! Here are a few of my friends with bigger brains than me! So Who Really Has The Biggest Brain? Who Has The Biggest Brain? – our competitive brain training title on Facebook has now been played by over 9m people in the world from over 200 countries and is still in the Facebook games top-10. We thought it might be fun to look at the results to date in terms of countries, states and cities worldwide and share the results from the over 350 million game plays so far. There’s a lot of data here but it’s worth checking out! First – the global winners. The bronze medal goes to Israel, scoring an average brain size of 2,161 cm³. Congratulations Israel! Second up is Serbia with 2,162 cm³ and finally (and you might want to play a quick drum roll in your head before you finish this sentence), the gold medal goes to Montenegro – scoring an incredible average brain size of 2,170 cm³! Meanwhile the USA (1,827cm³), Canada (1,814cm³) and UK (1,790cm³) ran a close race coming in at 91st, 96th and 101st respectively, but they’ve still got a lot of catching up to do if they’re going to have a chance at a medal in the next competition. Breaking it down further, it seems sunshine can do wonders for your scores because Hawaii led the charge for the USA with 1,942cm³ and California wasn’t far behind at 1,924cm³. Meanwhile South Dakota came second to last with 1,730cm³ with Vermont at the bottom with 1,727cm³, but then they do make great ice cream so they must be doing something right over there. In Europe the results are also pretty interesting, with Eastern Europe showing very strong performances such as Slovakia with 2,092 cm³. In Western Europe, France (2,032 cm³) out-scored its neighbor the UK (1,790 cm³). Southern European countries such as Greece (2,116 cm³), Turkey (2,079 cm³) fared considerably better than Northern European countries like Iceland (1,826 cm³), Sweden (1,760 cm³) and Norway (1,713 cm³). To focus on the UK rankings, we can reveal that the northernmost and westernmost reaches of the country beat their rivals in the South to the top with Edinburgh (1,833 cm³) taking pole position and London lagging behind at 16th place with an average of 1,787cm³. Hopping across the Atlantic again to Latin America, Peru took the top prize averaging at 2,043 cm³, while Paraguay fell behind with an average of 1,718cm³. We don’t think the scores reflect anything other than persistence and competitive spirit – players tend to achieve higher scores the more they play through learning tricks in the game. 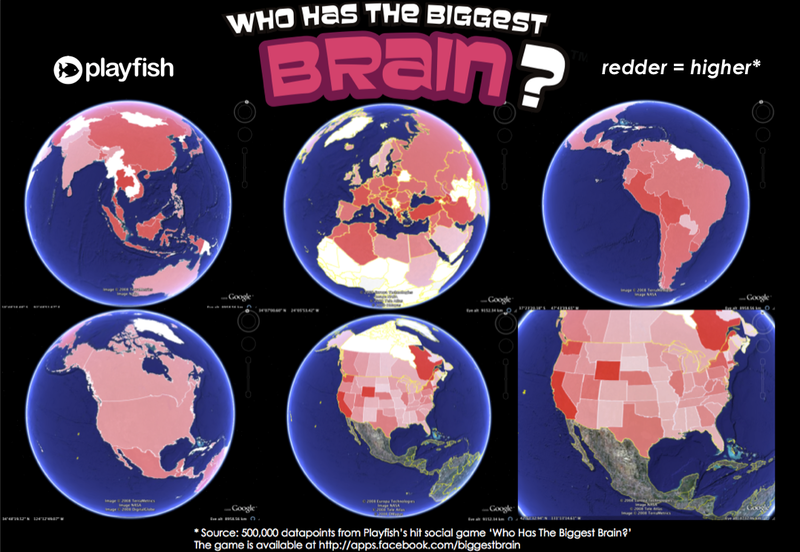 And we certainly don’t imply that it reflects any real differences in brain size or intelligence between countries or cities, but we had such fun looking through the data that we just had to share the results. If anyone has any interesting theories based on the game and this data, we’d love to hear from you! 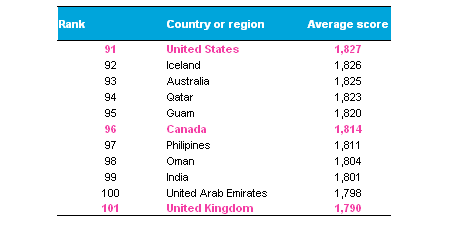 A quick note on methodology – we took a random, anonymous sample of 500,000 players, counted individual best scores from each country / city / state as determined by the regional network specified on Facebook and took an average of those scores. We only considered countries which had more than 30 players as part of the sample. The full set of data is available here for those wishing to look at more detail or quote from the source. Congratulations to the high fliers and commiserations to those who found themselves at the bottom of the tables. There’s always next time and remember, everyone’s score counts! Around the world with Playfish and Geo Challenge! It’s only a month or so ago that we launched Pet Society on Facebook – and what a month that has been. The game has already attracted over 1.5 million players, it’s made it to the Facebook games top-15 by activity and we’ve loved the amount of excellent feedback and suggestions we’ve received from our players. And we’re not done yet – the team at Playfish London is still hard at work fixing issues, adding features and completing the Stadium feature for the game so keep that feedback and those ideas coming! Meanwhile, it’s time to announce the beta release of our next title – Geo Challenge from Playfish China – our Beijing Studio. It’s been fun to see how many of you have appreciated the learning element in our top-10 titles Word Challenge and Who Has The Biggest Brain?. We wanted to expand on this a little further in our next game and explore a competitive game around knowledge of geography. Geo Challenge is designed for friends to compete and show off their knowledge of the planet. You travel the world together with our friendly tour guide and get to test your knowledge of countries, cities and flags in a collection of minigames. The game rewards speed as well as knowledge and accuracy and gives you a geography knowledge rating – or geo score – between Agoraphobe and Geography Guru with ratings like Bus Driver, Sailor and Airline Pilot in between. We’re still tweaking things and thinking of features to add, so all feedback is much appreciated. So, if you have a moment and feel like putting your friends to the test, give Geo Challenge a try on Facebook! You never know, you might even learn something new at the same time? Our second title is… Word Challenge! One of the frequent bits of feedback we’ve had on Who Has The Biggest Brain? is people asking if we can include some verbal games, to complement the ones based on numbers and abstract thinking. So we’re pleased to announce our second social game – a title that focuses entirely on verbal ability. It’s called Word Challenge, and it’s available to play now on Facebook. The objective is to create words from the letters provided as fast as you can. There are 40,000 to find and we’ve tried to keep the game very fast and arcade-centric, like Who Has The Biggest Brain? You start every game with two minutes of time to find as many words as possible, but you get bonus time whenever you find a word with four letters or more. When you run out of time you are shown the words that you missed – with the ability to click on them a definition of what the word means. At the end, you get a rating from 20 vocabulary types, ranging from mime to a poet – taking in drill sergeant, circus ringmaster, hermit and rock star along the way. We’re launching the game with English, Spanish and French dictionaries and will be looking to support more with time. We’ve pushed out the boat when it comes to connected elements too. 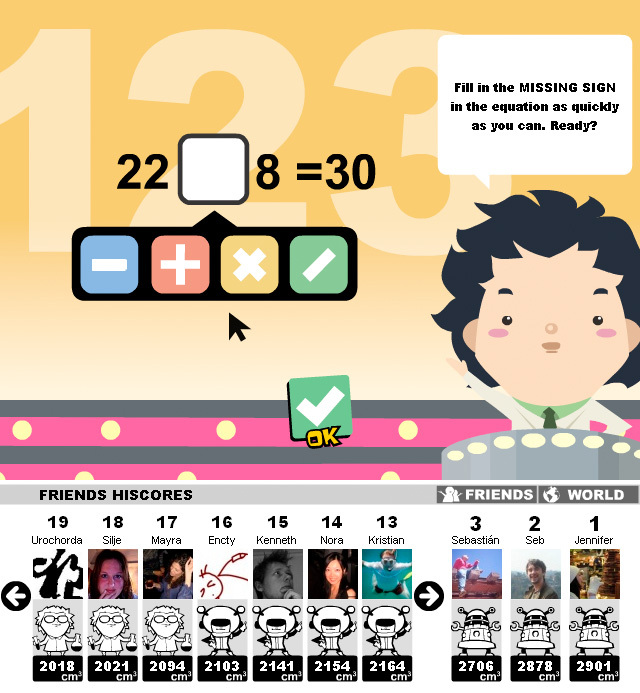 For example, there are bonus rounds where you have to unscramble your Facebook friends’ names for extra points. And we’ve got competitive elements like weekly, monthly and all-time high-scores between you and your friends. There’s also something new: a challenge mode, where you go head-to-head against a friend. It’s to settle those arguments about who’s best, without any complaints that one of you got easier or harder words to work from. It’s asynchronous, so you play through, and then your friend receives the challenge, and plays with the same words as you did. We’re really excited about Word Challenge and hope you’ll enjoy it. All feedback is welcome on the game forums as always! The past few weeks have been pretty significant for Who Has The Biggest Brain? Our competitive brain trainer reached 1 million installs as well as breaking into the Facebook games top-10 by active users (235,000 today). It’s currently at #7 chasing the likes of Scrabulous and Texas Hold’em Poker! It’s great to be in the top-10 less than 100 days after launch, but at Playfish we’re even more excited about the engagement the game is generating. Who Has The Biggest Brain? generates more than 1 million games played per day, with active users playing for around 25-30 minutes per day. Compared to the average time spent by Facebook users of around 20-25 minutes a day on the site we think our figures are pretty significant. We might not be at the level of the 50+ minutes a day racked up by the average user of casual games portal Pogo, but we’re still encouraged by our progress so far. It’s also been fun seeing Who Has The Biggest Brain? Become an object around which people interact socially, with some intense bragging and discussion about techniques going on in the forum. Our data provides an interesting counterpoint to Reuters’ recent article on how ‘social networks need to be useful to make money’, which was pretty down on “lightweight” games in favour of more “practical” applications like stock quotes and booking tickets. We’d argue that successful social games are anything but lightweight, especially when the social features are truly integrated with the gameplay. What do you think? In the first 25 days post-launch, 50,000 of you installed Who Has The Biggest Brain? It only took another 14 days to pass the 100,000 installs mark. Today, we also passed another milestone: 100,000 game plays a day. To put this in perspective, that’s almost 300 man days of brain training happening every day. In addition, we have also been ranked 19th most active app in the Facebook directory, just below Scrabulous (17th most active). We try to adopt an ethical distribution strategy (eg no forced invite, no spam) and your enthusiastic feedback is really encouraging. Let’s see how long it will take to reach 200,000 installs. Leave your guess in the comments and stay tuned for some fun new features coming your way real soon. Happy brain training! Today marks 25 days after the launch of Who Has The Biggest Brain? on Facebook. Thank you to everyone who has played, invited their friends and provided so much useful feedback. Keep it going! So far the response has been pretty encouraging given that Who Has The Biggest Brain? doesn’t have its full set of social features in yet. We’ve just passed 50,000 installs, 300,000 games played and seem to be hovering at a steady growth rate in users of 5-10% per day. We are updating the game with a few more social features and fixes based on usage data and feedback in the next few weeks, but our focus now is working on titles for our upcoming main launch as well as building our global organisation as quickly as we can. More on this shortly. Since we’ve now launched Who Has The Biggest Brain? on Facebook, I thought it would be a good time to open our company blog and introduce you to “the fish”! I’m Kristian Segerstråle, the CEO of Playfish (I’m also a musician and glider pilot, but more about those later!). Playfish is an international group of casual and mobile games industry veterans who believe that social games are the next big thing in the industry. We think World of Warcraft and Second Life are great for an evening at a time and hitting someone with a pizza using Food Fight on Facebook is a fun way to spend 30 seconds. But what we feel is missing is way for friends on any social network to play great games together whenever they feel like it. We want to combine the best elements from social networks, casual games, MMOGs and virtual worlds and create an entirely new way for people to experience games together. So we founded Playfish in October 2007 and raised around $3M in seed funding to get going. There’s now ten of us or so and growing quickly. We’re working to create something unique that we hope will fundamentally change how people think about playing games online. We will announce more details as we get nearer to launch, but meanwhile we thought we’d release a first title on Facebook – Who Has The Biggest Brain?. Try it out by adding the application to your profile! We believe in great game play, honesty, innovation and user feedback over marketing gimmicks. We also like keeping things nice and easy for the user without big downloads, obscure plug-ins, long registrations and fiddling around with credit card details. We are doing our very best to create the most inspirational, fun and interesting gaming experiences out there, and we’d love to hear what you think. So please drop us a comment if you love or hate the stuff we create. We are working on some really exciting things, so make sure you sign up for our beta to be the first to try things out as we release them. Also, if you are creative, share our passion for games and would like to be part of creating the next big thing in the industry, please get in touch at jobs(at)playfish(dot)com. We are always looking for talented and energetic coders, artists, designers and business guys and girls to join our team. For now, enjoy Who Has The Biggest Brain? and feel free to post your thoughts. We’ll announce more about the social games revolution soon!